A crafting, card making, soap, and cooking site. Dedicated to all things crafty and domestic. There's a NEW Paper in Town! 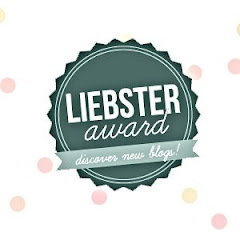 OK, I know, I haven't been very active on this blog...I'm WAY behind on my posts. I've been so busy keeping up with the store and the Gone Artsy pages that I've let this one slide a bit. I apologize for that. I think you'll be interested in today's post though! Designer Shellie Geigle is a really good crafter. If you don't know Shellie, look her up on YouTube (Click Here). 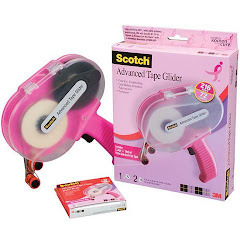 She has some fabulous tutorials on mini albums and other paper crafts. You'll love her, trust me. Anyway, she owns a store called J and S Hobbies and Crafts online where she sells a variety of items but the cool thing is, the just launched her own paper line! She's calling it Designs by Shellie. Currently she has one pad out and word is she's working on a Christmas pad. Can't wait to see it! I was lucky to be sent a 12x12 pad from her of her Tranquil Gardens papers. Let me tell you they are gorgeous! Beautiful plums, purples, and mossy greens are the main color structure. So today I did a video review and made a project using her designs. I just so happened to have a perfectly dark plum colored box that went fabulously with her papers! So here ya go, I hope you'll take a look and then stop by her store for more information! Valentines may be over but the trend at the moment is heart banners that are year round decorations. Since Romance is the theme for Miriam's Crafting Supplies and I entered a heart banner swap I thought a marriage between them was the perfect answer! Miriam's The Craft Source store (her brick and mortar) has Tim Holtz fabric and Wild Orchid Craft flowers that I ordered and used to create this. 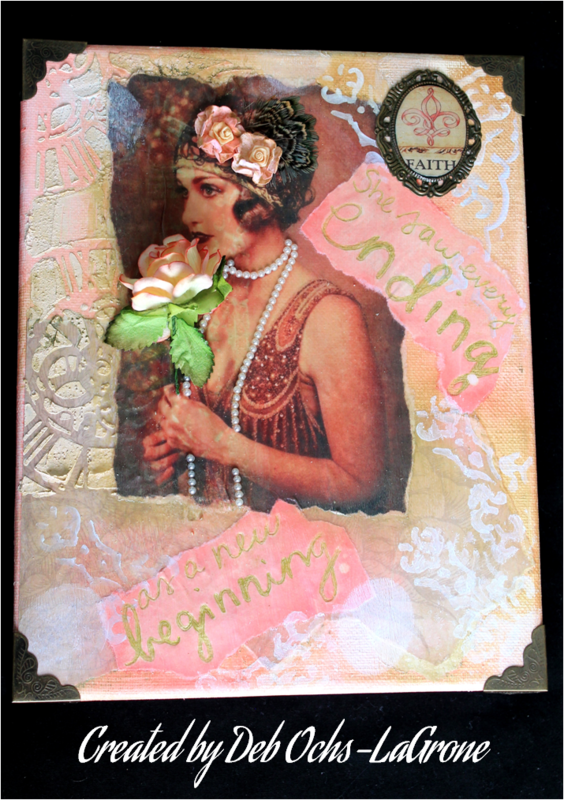 The embellishments are from both heronline supplies store and my Gone Artsy store. Thanks for stopping by today and I appreciate all you wonderful followers new and old! 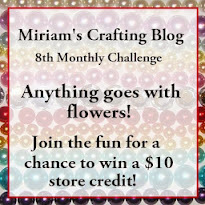 This month's challenge is all about Romance at Miriam's Crafting Blog. Romance does not have to be all kisses and red hearts. a quality or feeling of mystery, excitement, and remoteness from everyday life. "the beauty and romance of the night"
Romance can be an elegant piece of jewelry, it can be a beautiful sunset, or it can be soft and warm like this piece I am sharing today. 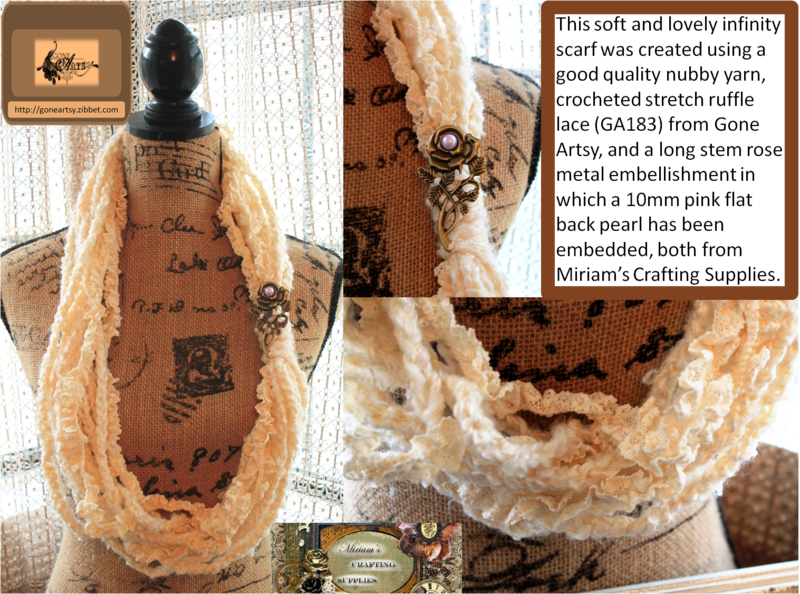 This infinity scarf would add just a touch of elegance and warmth on a winter day. It can even be doubled up to create a tighter neck area for additional protection on very cold days. To create this I started by crocheting with a good quality nubby yarn. When I got it to the length I wanted it I looped it and added in 3 loops of Ivory Crochet Ruffle Stretch Lace. I bound it together with another loop of crochet and stitching to make it durable. On top, to add some elegance and romance, I added a Long Stem Rose Metal Embellishment and I embedded a 10mm Pink Flat Back Pearl in the center. That is stitched on as well. It was a fun project and I plan to make more designs available for sale in the Gone Artsy Store. 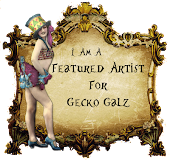 Speaking of Gone Artsy...I'm having a 20% off sale this week. On top of the everyday 25% off MSRP that's a lot of savings. Everything in the store is marked with only a couple of exceptions so if your interested in some beautiful things, Hop on over and take a look. Sale ends Friday at midnight CST! As always, thank you sooooo much for being loyal fans and followers! Hope you have a FANTASTIC Valentines Day! Continuing in the theme of Shades of White over at Miriam's Crafting Blog. It is my turn to create a tutorial. I decided to do a written one rather then a video this time around because the process was easy but time consuming for glue drying. My project is a Mini Clipboard. Nearly everything on it came from Miriam's Crafting Supplies with the exception of the feather, which came from my Gone Artsy store, and the calligraphy nib which I picked up at an office supply. The clipboard came from AC Moore. 1. Paint the wood part of the Clip Board with a light coat of gesso...you're going for a white washed look, not solid coverage. 2. Next glue the feather to the nib to create your "pen". 3. Place small round pearls in the tall clear glass vial and add enough clear glue to cover. Allow to dry completely. I used Journey Glaze. 4. Insert the "pen into the vial and a bit more glue to hold it in place. Dry thoroughly. 5. Paint some glue on the back of your ATC size canvas to stiffen it some. When dry use a round dowel type object (paint brush ends work great for this) and your heat gun to soften the glue enough to curl the canvas around the dowel a bit. Let cool and write your sentiment using a silver pen. 6. Place the canvas on the clipboard and glue in place. 7. 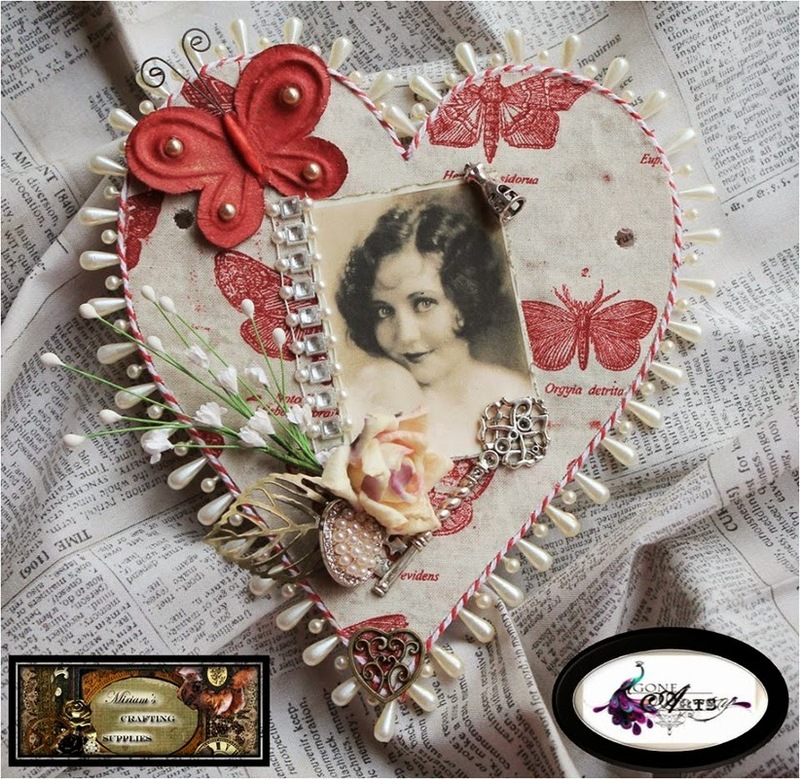 Embellish with your "pearl inkwell and pen" set and any other objects you so desire. I really love how this turned out and I have already been asked by someone if they could purchase it. We'll see, I kinda like it too much to sell :). 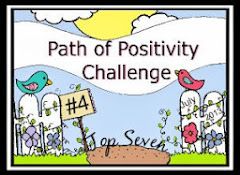 I hope you like it too...you still have time to join in the challenge at Miriam's Crafting Blog! Create something in Shades of White and enter! Well not here please LOL...I did my time in the tundra and am enjoying the more moderate weather here in Florida. But this month is Shades of White over at Miriam's Crafting Blog so of course my first thought was snow. I remember the way the pristine white looked against the red brick buildings and I always thought it was kind of magical in it's appearance so I tried to replicate that in a small wall hanging. Come join in the challenge...White is an easy color to work with! You never know you might be the next winner. I hope you enjoyed this very simple project. Anyone can do it! So come on...go join in on the challenge! In one of the FB groups I belong to we did a challenge in which you needed to use the words New Beginning signifying the new year. I had so much fun creating this mixed media canvas. I used some flowers from WOC and KS4U, some embellishments pieces from Miriam's Crafting Supplies, and some pheasant feathers from my Gone Artsy Store to top it off. I hope the new year brings you happiness, good health, and wonderful new beginnings! Create and enjoy life my friends! Happy New Year! It's still steampunk theme for Miriam's Crafting Supplies so for my second project this month I chose to make an altered cigar box for my cousin. He smokes cigars and gave me a bunch of boxes so I felt the best way to thank him for those was to make him an altered one for his humidor room. I used a traveling theme with a train, hot air balloon, clocks, springs, gear key, typewriter keys, chipboard gears, chains, a mini bottle and some resined chip board quotes. The paper was DCWV. 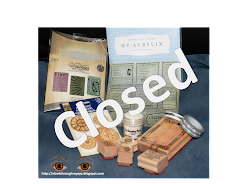 I also used a Tim Holtz Stencil and some DecoArt Terracotta paste. I'm in love with the clawed feet from Miriam's store. I think they really added to the piece. I had a ball making this. I always do when I'm working steampunk! I hope you enjoy peeking at it! I left the inside of the box plain wood.I wanted it to be rough and manly. I plan to put a bottle opener and a new cigar cutter in there for him. I'm hoping that he will love displaying it in his "special cigar room". 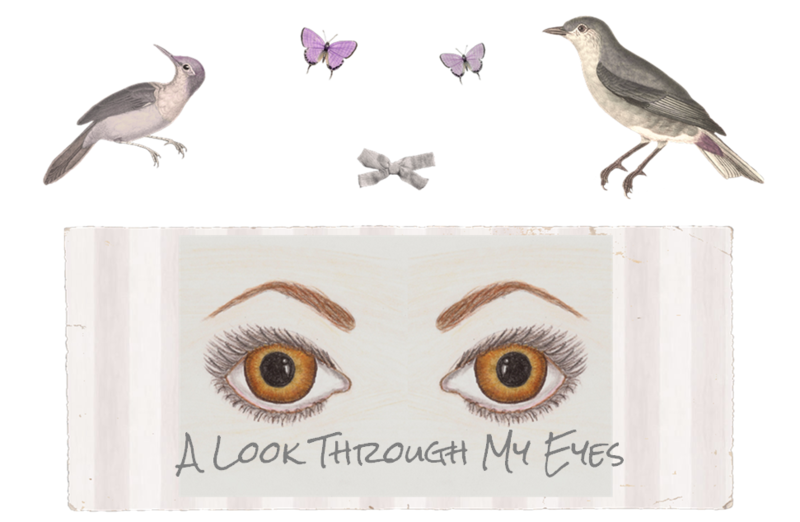 All contents of this website are Copyright © Deb Ochs-LaGrone of A Look Through My Eyes. All rights reserved. One photo from this site may be used in a "round up" type post as long as a link to me is provided. Currently Closed but stay tuned for more candy giveaway! Want to get this in your inbox? Sign up here! She has several other thing besides the pic once she gets to 500!